Earlier today, Samsung announced the latest high-end device in its Note series of large-format smartphones: the Galaxy Note 8. 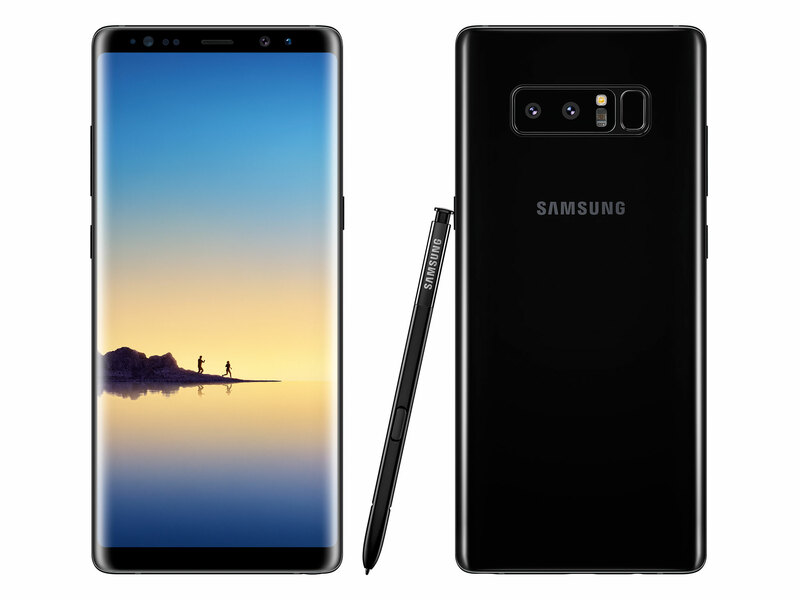 The new model is the Korean manufacturer's first device with a dual-camera on the back, but while Samsung is a little late to the dual-cam game, at least on paper, the Note 8's camera specs look quite promising. The camera module combines a 26mm equivalent 12MP wide-angle module (with 1/2.55" sensor, F1.7 aperture and optical image stabilization) with a 52mm equivalent tele camera. Like pretty much all other tele implementations we have seen on smartphones, the secondary camera comes with a smaller sensor and slower aperture than the main module - 1/3.6" and F2.4 to be exact. However, the Note 8 is the first dual-cam smartphone we are aware of to feature optical image stabilization not only on the main camera, but also on the tele lens. As you would expect, the dual-camera comes with a background-blurring portrait mode and can also record pictures with both cameras at the same time. 4K video, a 240 fps slow-motion mode at 720p, and an 8MP front camera are on board as well. Images can be viewed and edited on a massive 6.3" Quad-HD+ display that also allows for dual-window operation. Computing power is provided by an octa-core chipset that, depending on region, comes either from Qualcomm or Samsung's Exynos in-house brand. All of these components are wrapped up in a water and dust resistant (IP68) metal unibody that comes with the S-Pen stylus that is characteristic for the the Note series and offers improved sensitivity over previous models. The Note 8 will be released in stores on September 15th. US pricing for the unlocked model has not been released yet, through carrier T-Mobile the Note 8 will be available from $930. By the way a 2x crop of the Lumia 1020's camera sensor (in 4:3 mode) uses the same sensor area as the 52mm camera of the Note 8 (12 mm²). So because of the Lumia 1020's f/2.2 aperture even a 2x crop could capture slightly more light in low light conditions. Though a 2x crop would only yield ≈ 9.5 megapixels and I don't know how sharp the 1020's lens was. Would Dpreview review the Galaxy Note 8? Or will just forget it like it did with the Galaxy S7/S7+ and S8/S8+? Thanks god there are other sites which offer camera analysis of Samsung smartphones as it looks like Dpreview has Samsung smartphones on its black list. Samsung has 4K products? When did this happen? Samsung correctly calls it "UHD." It would be like Canon releasing a "Xerox machine." Once Samsung chief is charged, the former impeached President could be the next to be charged. FWIW, this former President's father was also the President who was assassinated in 1979 after his wife, the First lady, was assassinated in 1974. Sounds great, but the nerd in me wants to know if the note-taking features have been enhanced. How many of these features work for video? Can you zoom while shooting? Shoot with simulated bokeh? Only as far as bokeh is concerned. No, amount of captured light in low light conditions. Take out the phone feature and leave it as a small flat camera. Or just don't use the phone? mmm, would have preferred an ultra wide angle lens (like the G6) to a tele lens, but thats no biggy, looks promising, lets see what the reviews say in a few weeks. Actually, the "tele" lens naming is incorrect. It is really what the photography world calls a "normal" lens. For taking pictures of people, which most people do, the normal lens is essential. Galaxy Note 8 will not be compatible with LTE Band 71? Absolutely NOT. Tmobile's Best spectrum, 600Mhz is of absolutely no use on it's variant of the Note 8 and when 5G Evo/5G gets flipped on, Even though T-mobile will be rolling out 5G "Sometime" in 2019, and on all their carrier bands, 600Mhz will be the first and then you'd ONLY be able to use 5G Dataspeeds until then if you're actually connected to an Alternate Carriers 5G/5G Evolution towers if the Note 8 T-mo edition has those bands and permission to carry on through those bands. Goodluck if you're a T-mo idiot out here, I had them for 3 years, and it was the absolute worst service I've ever had. It was my phone for work, Personal phone. Was managing a sales team throughout my market. People would call me, it'd go directly to vmail and not even notify of a missed call/voicemail. My phone would be on, usable, network connected, no problems. I was literally sitting in a car next to a person, they called me, went immediately to voicemail as if I had no service...I had 4 bars. No notif. I'm on T-Mo and don't consider myself an "idiot", as you say. I assume you just chose your words poorly. Additionally, I've been on ATT for years, Verizon for years, and now T-Mobile since 2011. In the Los Angeles area, I've found T-Mo reception, connectivity, and forwarding to voicemail to be equivalent or slightly better than Verizon, but ATT was the best (15 years ago). "Panda", it's important to understand that everyone's experience is different, and you shouldn't draw universal conclusions from your experience. Mid-level phones from 2013 had the same lame 64Gb storage as this supposedly flagship model. Get the OnePlus Five - more RAM, more storage, also dual cameras, half the price. OnePlus 5 screen is garbage compared to this, it's still using the horrible pentile layout and has an effective res of about 2/3rd its stated res. Colour accuracy is not up to par. If you are going to use pentile, it needs to be much higher res, at least QHD. Apart from that the number of bodged software updates they release is a joke. They just had to pull another update last week. So many issues as they say you get what you pay for. OnePlus 5 is a great value, but there are reasons to get the Note. Larger screen at higher res, memory card slot, water resistance, and of course the stylus. Both of them are overpriced. Mi 6 is the way to go.. I've had android phones with SD cards for about 3-4 years now, and I personally don't really care how much internal space it has as long as I can install all of my apps. I store *everything* on the SD card (256GB) on my S7E. It's the "live" portion of my backup plan. If the handset goes south or I have to trade it in, or I upgrade, I just swap the card to the new device. Bootloops happen, as do random bricks - and a SD means I can physically remove my data. Also, with 180GB of media I carry around, that's a long, long restore no matter what method you use. Oh, and they're offering a free 128GB card if you pre-order - that's 192GB in the "base" model, effectively. "Mid-level phones from 2013 had the same lame 64Gb storage as this supposedly flagship model"
That was news to me. Which ones? "Get the OnePlus Five - more RAM, more storage, also dual cameras, half the price." RAM: It CAN have 8GB (2GB more than the Note 8) But again, BASE model is 6GB. Oh Wait, It can support LTE (4G) Category 13 data speeds when 5G Evolution is coming out on AT&T and Verizon in 20+ Major cities by the end of 2017!!! That's only a MAX of 390/150 if you're IDEAL with no other people on your tower and the network in peak performance. The other problem is only 1 lens with PDAF and none dual pixel. Wait! OnePlus 5 DOES WIN at a front camera of 16MP! Also no Audio jack? Seriously? Look at Apples F-up! I'm sorry, NOTE 8 WINS! Also, Samsung's Phone+ --> $99 deductible on ANY replace issue! I have a Note 2. Fantastic phone. It still has features some new phones don't have. Finally, after almost five years, it has a problem with the audio jack, but the original battery is still going strong, and everything else works. It's finally time. I'll be getting the Note 8. I'm looking forward to the new cameras and 4K video. same boat. my note 2 is still running and kicking... even with a cracked screen after dropping it several times on the pavement. i still love my note 2 very much but it has become so unbearably slow. too slow to run most apps. might be time for an upgrade! I've dropped my so many times I've lost count. I have an Otterbox case, though, and when I take it out for cleaning the screen, the Note2 looks like brand new. I can still run apps OK, but browsing the web is pretty slow. I have used my Note 2 for appr. 4 years and replaced it with a Note 5. Huge difference in speed and capabilities, and I am sure this Note 8 will be another big step! Lets see if this Note 8 can replace some scenarios where I use my E-M5. I think the Note 8 will have a good camera, but it can't compete with a Micro Four Thirds sensor, which is many times larger. F1.7 on a 1/2.55" sensor is the same physical size as F2.4 on a 1/3.6" sensor. Presumably, it's done this way because they need to have identical depth of field. 1/3.6" is a smaller sensor, so should not it be the other way round? Besides, the angle of view is 2x different, did you take that into account? no, it's a smaller sensor with a smaller aperture...they have to do this to keep the camera module small enough to fit into a slim smartphone. It seems to be a smaller sensor with the same entrance pupil. F number is focal length over pupil diameter, so pupil diameter is focal length over F number. I double-checked the math. It comes out right. The main camera will be a 3.78 mm lens with a 2.22 mm pupil and the secondary would be a 5.35 mm lens with a 2.23 mm pupil (probably a round difference). But same aperture diameter does not mean same depth of field by the way as the field of view is different. Moreover aperture diameter is not relevant for image quality. @aceofsevens, you have chosen wrong crop factors. I may have calculated the crop factors wrong. I was using Wikipedia's claimed 1/2.7 factor for 1" sensors as a basis, which may not be correct. View angle doesn't affect depth of field. It's just a matter of pupil diameter and the focal distance. A 50mm F1.8 on a crop camera is just the center of a 50mm F1.8 full-frame camera in effect. The viewing angle is a matter of how big the sensor you put behind it, not properties of the lens itself and the lens is what determines depth of field. As for image quality, I didn't say that's a factor. Image quality is a matter of the total light captured (which will be lower for the telephoto, but with interpolations, this may not be a big deal). Depth of field is a matter of subject distance and pupil size. It has to be the same for both cameras for the images to match so the computer can interpolate them. No, photographic depth of field also depends on the field of view and the resolution. For instance a 1 megapixel landscape image will be sharp nearly everywhere (very large depth of field). But yes, 2x digital zoom with the main camera should have about the same depth of field, I guess. Yes, but for this application, it's the real-world size of area of confusion that counts, not its size relative to the pixels. They do not "have to" keep the DOF the same, and it is not. Why wouldn't DOF be the same? I suppose it's possible, but interpolating between two images that are focused at the same point with different depth of field when you have other ways of gauging depth seems to add a lot of complexity for no gain. You need the same equivalent f-stop, not the same physical aperture (when the eq. FLs are different) for the same DOF. But 35mm F1.8 and 50mm F1.8 on a full-frame are the same F-stop, but different depths of field. That is why I said "equivalent". Equivalent f-stop is for comparing different formats, though. I.e. 25 mm F2 on M4/3 is equivalent to 50 F4 on full-frame. Equivalent for comparing DOF means same pupil size. It just gets more involved to calculate when they aren't the same angle of view. So basically there are two cameras with the same optical construction, but the 52mm camera has smaller senzor thus it has bigger crop-factor. I don't think this is correct. The smaller sensor has an effective double the focal length, but the sensor isn't half the diameter, so these would be different lenses. By my math, they would be a 3.78 mm & 5.35 mm lens. Ok, i was probably wrong. I recalculated it and if the optical construction is the same for both cameras, the second camera would be only approx. 36mm not 52mm. hmm.. this.. or the upcoming S9+ with better... everything? but also a larger battery due to no S-pen? "Save as RAW file" is only listed under wide-angle camera. Maybe it will be possible with 3rd party apps? By the way the main camera seems to have a 27mm field of view (77°), not 26mm. Also no dual pixel autofocus, no manual mode (pro mode), no slow motion and no panorama for the 52mm camera. I'm pretty bummed about the lack of RAW and Pro Mode support of the telephoto lens. The magazine I work for and I had planned to shoot a cover with this phone for mutual publicity reasons. Kinda bummed about no RAW, mostly, but we'll see. I like the name - Note8 - or Notate. I know it's pure coincidence, but I still like it! Are those allowed on planes? 2016 wants its joke back. Decent telephoto lens/camera despite the small sensor. It has OIS and I saw it is capable of ISO 25. At ISO 25, it is hard to tell that it was taken by a tiny sensor. The iso 25 sample images have very noticeable noise in the shadows. But maybe these are just jpg artifacts. Don't know which image you're looking at, but that sensor is only 1/3.6" . With ISO 25, they seem taken by a 1/3" - 1/2.5" camera sensor. Iso 25 image quality should be equivalent to Iso 50 on a 1/2.55" sensor or Iso 60 on a 1/2.3" sensor or ≈ Iso 90 on a 1/1.7" sensor. can you take notes with an s-pen? @antares103 - no, the S8/8+ don't work with a stylus. After having the Note 7 and using the stylus + screen off notes, I've been impatiently waiting for the Note 8 to show up. I don't expect much more from the Camera, but for a phone the camera is very good already (tho I'm super disappointed in the 1/3.6 normal lens - I refuse to call 52mm "telephoto"). Bonus for me: I had a Note 7, so I get the $425 trade in. And I can send in an old iPhone 5 and keep my S7E for GearVR use. Plus I got to order an unlocked model. The N7 was a fiasco, but just fabulous hardware. I honestly can't wait to get my N8. I don't mind an edge to edge display, but wrapping it around edges is totally idiotic. Writing on the edges... Just sad for a produt to take notes! On my Note 7, before I had to ship it back, holding the phone kept registering as touching the edges. Agree. The display wraparound just makes it easier to break. If the back is glass, then that's a deal breaker for me. Samsung FORGOT that there are actual SERIOUS USERS of the Note. It's well done on the Note 8. Most everyone is going to have some type of case on it and with that there's just enough curve to use, especially for scrolling with your thumb, and it works well. I have a Note 8. I had the same problem as the Note 7 where my hand that was holding it kept registering as touching the edges until I put a case on it. Why can't we have a second sensor that is at least 1/3" when paired with a 1/2.5" main camera? I know the G6 and V30 have both the second sensor at 1/3", but the main sensor is also 1/3"(and some have said not as good as the G5s camera in certian situations). By the the way has Samsung confirmed that the 52mm camera has a 1/3.6" sensor? The official Samsung website does not seem to state the sensor size. Or is this spec list just a copy from gsmarena who often list wrong or unconfirmed specs? I have had a Note 3 and currently the Note 5. Great phones. But, I so want to try an equally performing ecosystem and my great hope was that Nokia would arrive in the 11th hour. The Nokia 8 and reportedly the 9 are still miles away from what this phone offers. I REALLY like the idea of the Sony premium compact phone....I am more rational that others I think...I am not obsessed with zero bezels and I actually PREFER a THICKER phone. If the phone could be smaller than a rocketship, thicker than a credit card, I could have a long lasting battery, have high performance and not try and tell people that I must have a small pen*s because my phone is so big. I am with you on the thicker phones. I prefer the feel of a phone with a case than without one, and I'd gladly give up some phone thinness for a decent camera. Instead of these dual FL setups I'd much prefer a FFL array with multiple modules for better IQ. The Note 8 is thicker than any S or Note from the past few years. It's great that the 52mm camera has OIS, but probably it will still capture much less light than the main camera in low light conditions. Equivalent aperture is 2 stops darker and the shutter speed likely needs to be faster than the main camera. the real question is.. does it catch on fire? I don't know, but I hope that a portable fire extinguisher is included. Amazing how quickly we reach $1K in today's electronics world. $1k is just for the silly people that buy the phone outright without waiting for promotions. I got my S7 for $350 brand new 2 weeks after it came out due to a buy one get one promotion. In my locale they get you on plans. That is, in order to qualify for a $0 or reduced price phone, you have to go on a 2 year plan at a minimum dollar amount. If you can live with less minutes and data, then buying outright is cheaper. That said, for the actual organization, function and surfing, a 100 dollar smartphone does what I need to do. The only benefit to a nice smartphone is the cameras...which can be offset by grabbing a descent compact. I have just seen first official full resolution samples from the portrait mode. The portrait mode seems to have severe issues, much blurry hair. Do you have any links? The fake bokeh effect does have significant limitations - I've seen plenty of unconvincing examples from the iPhone too. But I'm sure we'll see some side by side comparisons before too long. But given the low standards they are accepted these days - images <1MP posted on Facebook and viewed on a smartphone - they may be right. Try downsizing the images to 25% (on the linear sides) and they look fine for these purposes. The phones are cheap compared to the service costs. Assuming you pay full retail and trade in a late model phone, it's $650 for this handset (not including any value you receive as a promo). A major carrier unlimited postpaid (standard) plan is between $50 and $90/ month, or $1200-2100 over a 2 year product cycle. You'll pay 3x as much for the service as you do for the hardware. Is this camera better than the iPhone 7 & 7 Plus? How it compares to the next iPhone 8 is what's relevant. The tele camera is better - the iPhone's doesn't have stabilization and the Note's lens is about 1/2 stop faster (f/2.4 vs f/2.8). So the Note's tele lens will be more usable in low light. To me, the difference will be if you can elect in Settings for the 2X camera to go on every time you request it to. In the 7 Plus, it only goes on if there's sufficient light since Apple doesn't trust us with the option of just holding steady to accommodate the slower 2X lens in lower light. In those cases, Apple just uses the base camera and zooms it digitally. So I am forced to use other standalone apps for the 2X zoom, such as Camera+. The other critical factor will be its Portrait Mode separation. Apple's success at this still astounds me to this day, almost a year later. If Samsung is more than $900, we should expect Apple go north of $1000! Sad. Not really when you realize that these are NOT just phones - they’re pocket computers with phone, camera, gps, game console, compass, calculator, word processing, etc ... all built into ONE device. Yep, pretty soon the smartphone will reach netbook size, if it hasn't already. I prefer traditional cell phone + netbook, where I have a full-fledged operating system (WIndows 10) and don't have to go through Google or Apple to do just about everything. The difference b/w Apple and Samsung is that while Apple sticks to the list price, Samsung doesn't. For Samsung, it is simply a "list" price.